The Palestinian Prisoners Society (PPS) has reported that Israeli soldiers abducted, overnight and at dawn Thursday, seventeen Palestinians, during massive invasions and searches of homes in different parts of the occupied West Bank. The PPS office in Qalqilia, in the northern part of the West Bank, said the soldiers abducted six Palestinians, in various parts of the district. The abducted Palestinians have been identified as Yousef Yasser Sweilem, 23, Kathem Mofeed Radwan, 24, Mo’men Farouq Abu Haniyya, 25, Abdul-Rahman Bilal Radwan, 23, Mohammad Nasser Dahbour, 55, and Saher Hisham Adwan, 42. In Nablus, in the northern part of the West Bank, the soldiers searched a few homes and abducted Ahmad Abu Basseer and Rami Abu Hweila. 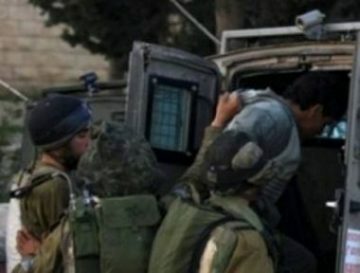 In Tulkarem, also in the northern part of the West Bank, the soldiers abducted three Palestinians, identified as Ismael Adwan Mekhel, 23, Mahmoud Mohammad Shehada, 31, and Jad Abdul-Rahma Yahia, 38. In Ramallah, in central West Bank, the soldiers abducted Abdul-Halim Hamed and Ja’far Abed Erbash. In Hebron, in the southern part of the West Bank, the soldiers abducted Monatser Wajeeh Abu Ayyash, and Mohammad Zeidat, the son of Fayez Zeidat, who was killed by the army in 2012. In occupied Jerusalem, the soldiers also searched homes and abducted Yassin Qanbar, 20, and Mahmoud ‘Oweisat.